Today is the day to take charge of your money. Learn the basics needed to change your financial future forever. 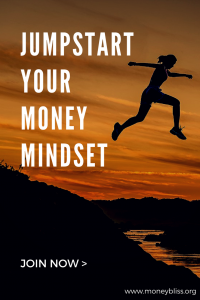 This free Jumpstart your Money Mindset is designed to evaluate your current money situation and start making the necessary changes. We will cover your money mindset and set you up on a path to financial success. You will gather the tools, worksheets, and tricks to become successful with money. Over the course of five days, you will get a email a day packed with helpful information to change your money mindset. Jumpstart to Money Mindset is important for your financial future. The time to start is now and not delay. MONEY IS THE LAST THING ANYONE WANTS TO DEAL WITH, BUT IT IS THE FIRST THING TO CAUSE PEOPLE STRESS. How to Let Go Previous Financial Failures and move past them once and for all. How our Emotions and Money are Intertwined. Learn how to make sensible decisions with money. The Cash Flow Killer (debt) in your Life and how it is holding your life hostage. How Savings Can Fund Your Bliss and let you enjoy life. Giving is Correlated with Debt & Saving. Learn to enjoying the fun of giving. How to Create A Cents Plan and Why a Budget is too restrictive. Set up your future success with money. Money Bliss Steps to Financial Freedom to achieve success. Plus each day includes an action checklist to make sure you succeed! “Jumpstart Your Money Mindset is exactly what it states, a chance to be motivated to have a new relationship with money. It is a wonderful balance of encouragement and practical tools that are helping to shift my thinking about money. I feel empowered to take baby steps to see what I am capable of doing with my finances.” – T.S. “I thought this free course was great! It really helped me get a grasp of where I stand financially and then how I can start taking some steps to improve things.” – K.W. Stop living paycheck to paycheck. Get of debt. Save for your future. Understand what financial freedom means. Find that place where you can enjoy life and money. Change your life now. Join today! Success! Now check your email to confirm your request and begin Jumpstart to Money Mindset. **There is a very important email waiting for you. Please take the time to click the link! Then, you will be on your way to Money Bliss! ** If you don't get an email right away, please check your spam or promotions folder, too!